It’s been a really brutal month at work, and I haven’t had ANY time to get into the garage. However, the Thanksgiving holiday is upon us, and I finally have a little time off. While at the local Harbor Freight store picking up some extra dividers, and a set of number stamps I saw a Kids Tool kit for like $15 and had to have it. The only really useful thing in the kit was a small hammer, but the hat goggles, and suspenders were fun for him to play with. This lead me to something I’d been thinking about for a while, how to do teach my kiddo how to work the wood, and when to start. I’ve decided to start now, even though he’s not even four yet. I’m going to start by teaching him a tool at a time, like a true apprentice. 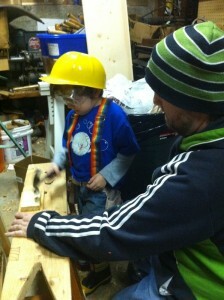 The first project will be a small tool tote in Pine for him. I’ll do the cutting and stuff, but he is going to do the nailing part. And he’ll get a hammer to put into it. After that we can work on sawing, and other tasks. I learned by helping my dad in his wood shop. I spent a lot of time with him in the basement, watching him work and him telling me the hows and whys. I was probably about 10 before he let me start doing things.